The 99th Japanese High School Baseball Championship (aka Summer Koshien) wrapped up last Wednesday with Hanasaki Tokuharu defeating Koryo 14-4 in the title game. (Koko Yakyu has a great writeup of the game here.) It was the school's first ever championship and actually the first Koshien championship ever won by a team from Saitama. 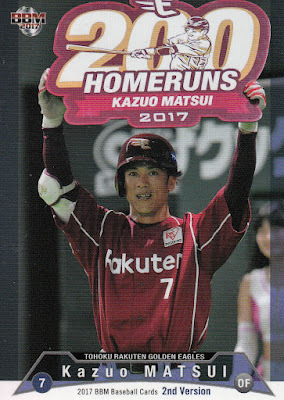 The talk of the tournament, however, was Koryo's catcher Shosei Nakamura who had 19 hits in 28 at bats including 6 doubles and 6 home runs. The numbers work out to a batting average of .679, an OBP of .688 and a slugging percentage of 1.536. He also had 17 RBIs and scored 12 runs. He set new tournament records for home runs, RBIs, and total bases and tied the records for most hits and doubles. Needless to say, he made the tournament Best 9 team. 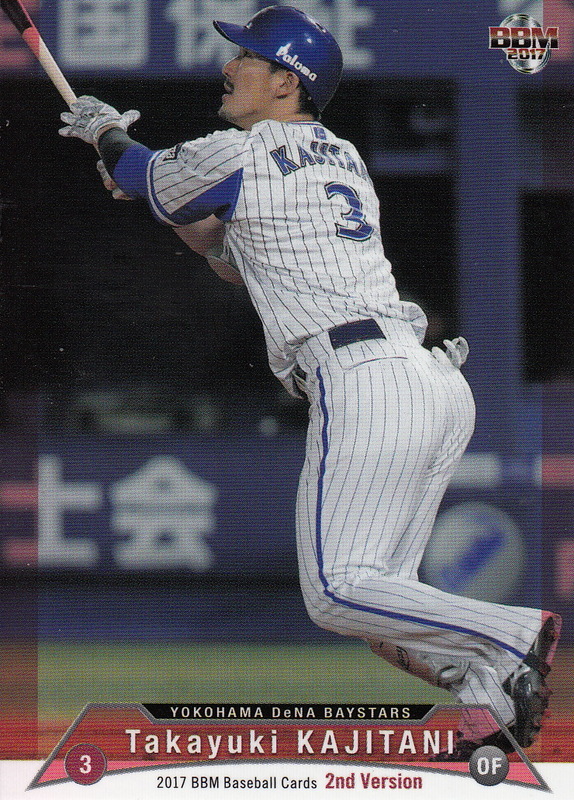 The previous home run record was set by PL Gakuen's Kazuhiro Kiyohara in 1985. 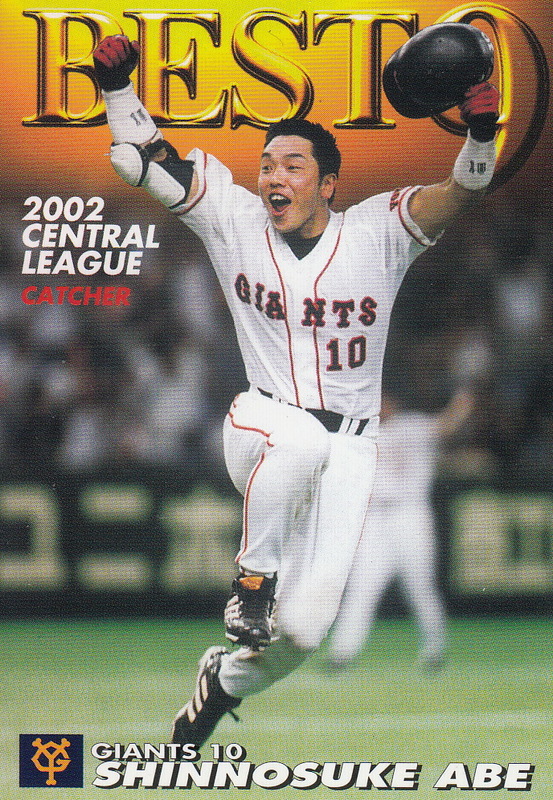 Kiyohara of course went on to have a 22 year career in NPB playing for the Lions, Giants and Buffaloes. He had 2122 hits and 525 home runs in his career. These totals would have made you think he was a shoe-in for the Hall Of Fame and you'd be right except for the fact that he had always been associated with "seedy" elements off the field. I fear that his chances for being enshrined ended last year when he was arrested for use of illegal drugs. Memorabilia Cards: Jersey cards for Seigi Tanaka and Chihiya Sasaki along with a "Combination" jersey card with both of them. The single jersey cards are numbered to 200 while the "Combination" card is numbered to 10. There's a patch version of the Jersey cards that are numbered to 20 (not sure if there's a patch version of the combination card). There are autograph cards of many players available as well as autographed version of many of the Ceremonial First Pitch cards. 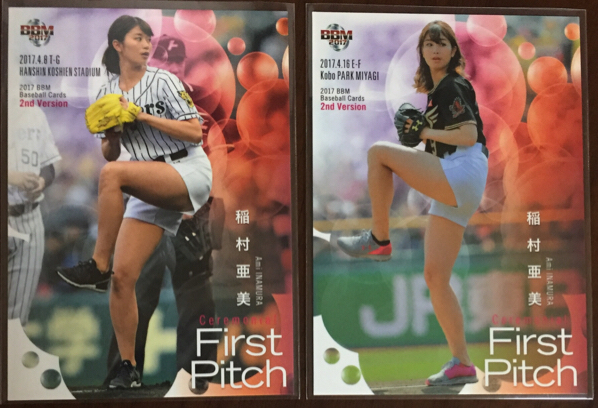 Parallels: 12 regular player cards as well as the Marines team card and the Ami Inamura Ceremonial First Pitch card have a "secret" alternate photo version. 10 of the 1st Version Update cards and 54 of the regular player cards have five different facsimile autograph parallels - silver (unnumbered), gold (numbered to 100), hologram (numbered to 50), red (numbered to 25) and green (numbered to 10). There are two parallels for the "Cross Squall" cards - one is numbered to 100 and the other is a "1 of 1". 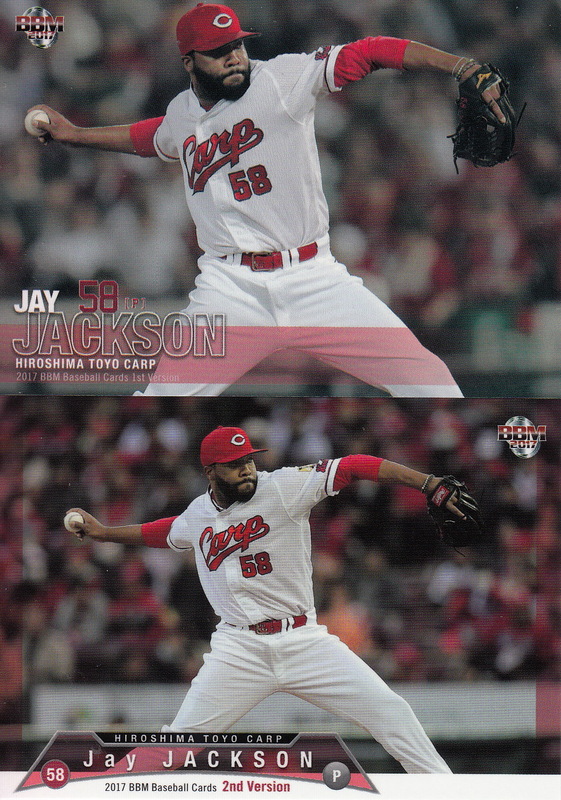 There are two parallels for the Ceremonial First Pitch cards one numbered to 100 and the other to 50. I think there are two different parallels for the Bright Stars insert cards - one numbered to 150 and the other numbered to 50. Man, not having the detail promo sheets for the set from Sports Card Magazine really makes it harder to list what parallels there are. I'm basically searching Yahoo! Japan Auctions to see what's there. I've mentioned this before but I feel like I really don't have much to say anymore about BBM's flagship sets. Especially since the sets have pretty much been the same the past three years. The last two years BBM's put a card of Shohei Ohtani batting in the 1st Version Update subset of the 2nd Version set. This time they gave him a "regular" 2nd Version card instead - I'm kind of wondering if it's because he had a "secret" version card in 1st Version showing him batting. If I've counted right there are 32 players with a "regular" 2nd Version card who did not have a 1st Version card. They are Tomohisa Ohtani and Tatsuya Uchi of the Marines; Atsushi Fujii, Jordan Norberto, Yu Satoh and Daisuke Sobue; Takuya Kai and Hiroaki Takaya of the Hawks; Kentaro Kuwahara, Masahiro Nakatani and Ryutaro Umeno of the Tigers; Yuta Nakamura, Ren Nakata and Ryoma Nishikawa of the Carp; Yohei Kagiya, Luis Mendoza and Hiroshi Urano of the Fighters; Hikaru Itoh, Koji Ohshiro and Kengo Takeda of the Buffaloes; Fumikazu Kimura, Shuta Tonosaki and Naoto Watanabe of the Lions; Japhet Amador and Hiroyuki Fukuyama of the Eagles; Takahiro Araki and Ryota Yachi of the Swallows, Yoshiki Sunada of the Baystars; and Miles Mikolas, Ryosuke Miyaguni, Kan Ohtake and Soichiro Tateoka of the Giants. 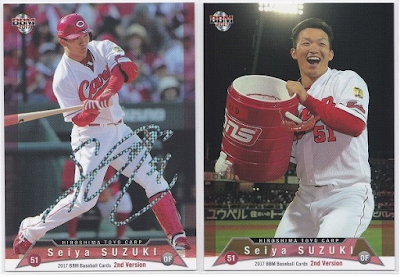 Since there's no overlap between these guys and the 36 players in the "1st Version Update" subset, the 2nd Version set has added cards for 68 players who didn't have one in 1st Version. I did notice one oddity about someone who's not in the set - Seigi Tanaka of the Hawks. So one of the two players who has a jersey card in the set doesn't have a "regular" card in it. The "1st Version Update" subset contains cards for 36 players (3 pet team) that for whatever reason did not appear in the 1st Version set. This includes both late signing players like Munenori Kawasaki, Alfredo Despaigne and Rafael Dolis and just players who I guess BBM just didn't think were significant enough to be in the earlier set like Hitoki Iwase, Takumi Akiyama and Kazuki Yabuta. 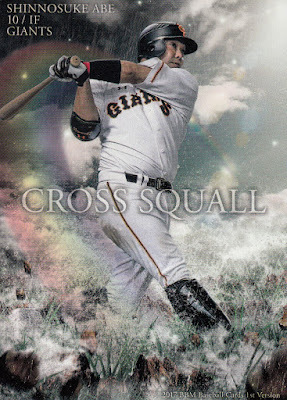 As I say every time I write about this set, I have no idea what makes BBM decide to put a player in this subset rather than give them a "regular" card - I suspect it's random to some extent. Most of the players I had noted about being missing in the 1st Version set back at the beginning of July are included in this set. 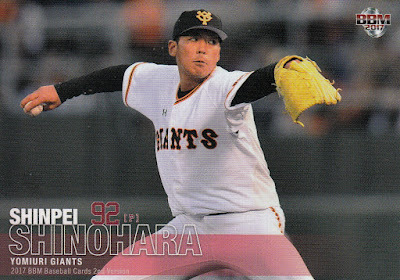 Really the only player who was with their team before the beginning of June that I mentioned who is not in the set is Ramiro Pena of the Carp. 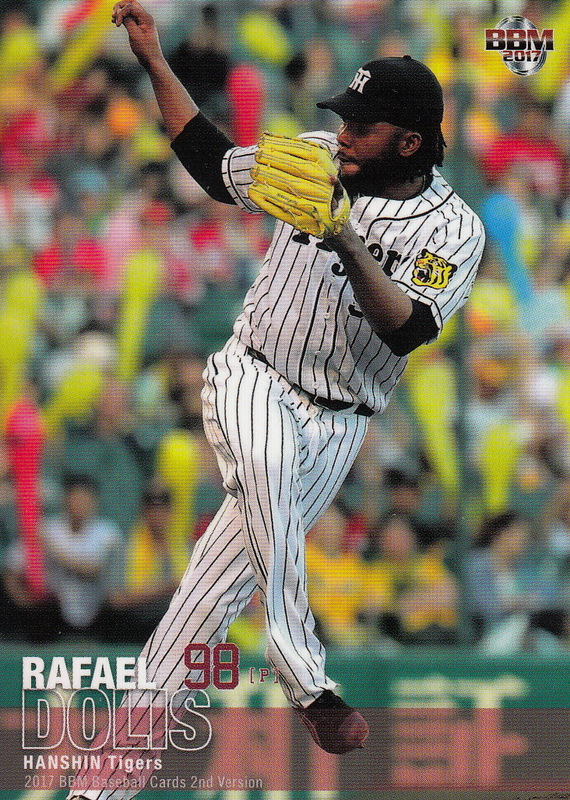 None of the players I mentioned who signed with their NPB teams after the beginning of June (Chris Marrero, Xavier Batista) are in the set - as I said in that post I'm really hoping BBM does another Fusion set this fall with an extended "1st Version Update" subset. 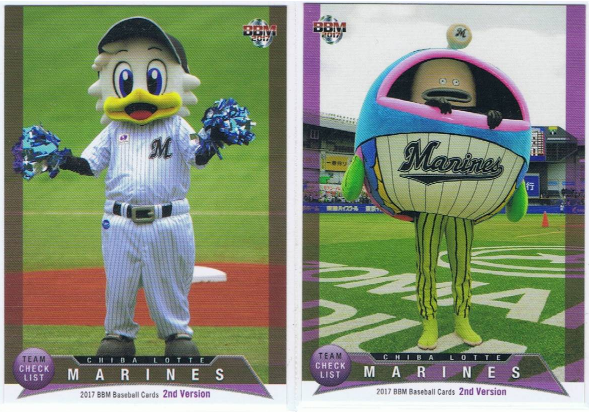 The theme of the team cards is mascots. Again. The last subset for the set is the annual "Ceremonial First Pitch" set. This time around it's 13 cards of various celebrities throwing out the first pitch before games. The cards are numbered separately than the rest of the set - FP01 to FP13. The subset includes actress Haruka Christine, model Nicole Fujita, the aforementioned and ubiquitous Ami Inamura, model/actress Anna Ishibashi, actress Yukiko Kawabe, Tacoyaki Rainbow singer Saki Kiyoi, politician (and first female governor of Tokyo) Yuriko Koike, actress Ayano Kudo, Morning Musume singer Maria Makino, actress/model(?) Chiaki Taguchi, actress/model Rena Takeda, actress Chika Yamane and actress Miyu Yoshimoto. As always you can see all the cards (including parallels, insets and "secret" versions) at Jambalaya. 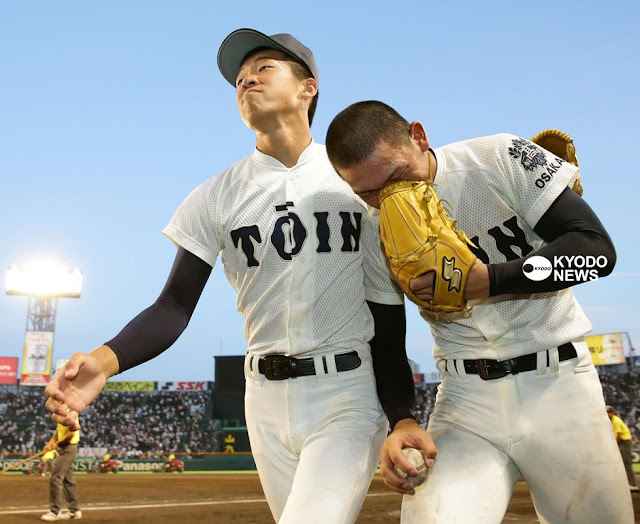 Osaka Toin is one of the power houses of Japanese high school baseball. They've won the Summer Koshien tournament three times in the past ten years and they've also won the Spring (Invitational) Koshien tournament twice in same time period (this year and also 2012 when they became only the seventh team to win both tournaments in the same year). Still - winning three times in 10 years means that they didn't win it seven times so it wasn't a huge surprise that they got eliminated yesterday. What was a surprise was how they got eliminated. For more details about the game, check out the Koko Yakyu blog's post for the game. The box score for the game can be found here. 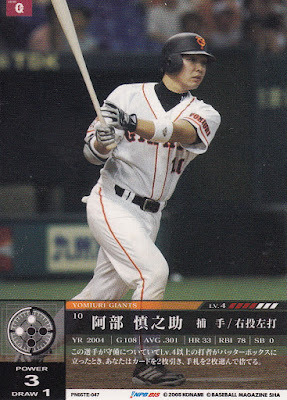 There are a number of NPB players who are Osaka Toin alumni. The school didn't add the baseball team until 1988 so all the players are relatively recent. The list of alumni includes Hideto Asamura, Takeya Nakamura and Tomoya Mori of the Lions, Tsuyoshi Nishioka and Shintaro Fujinami of the Tigers, Sho Nakata of the Fighters and Ryosuke Hirata of the Dragons. 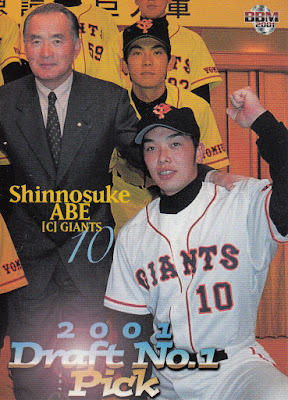 I'm late at getting to this but last Sunday Shinnosuke Abe of the Yomiuri Giants got his 2000th career hit. 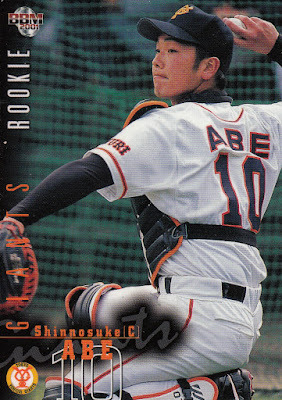 Abe was the Giants' first round pick in the fall 2000 draft out of Chuo University and has been a starter with the team ever since Opening Day 2001. He was the team's catcher up until 2014 and then started transitioning to first base - he didn't catch any games at all last year. 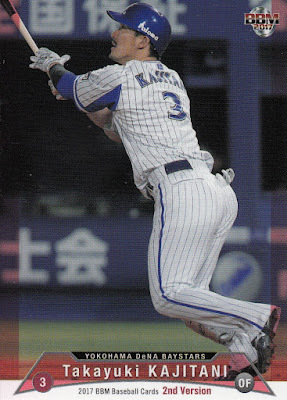 With 387 he's the current active NPB home run leader. 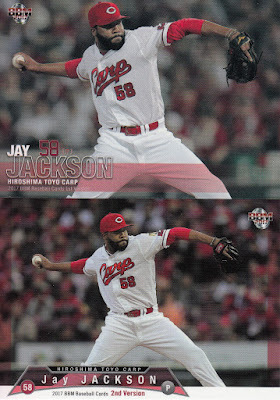 - There have been no new KBO sets this year and the KBO sets that have been released over the past few years have not contained cards of foreign players. 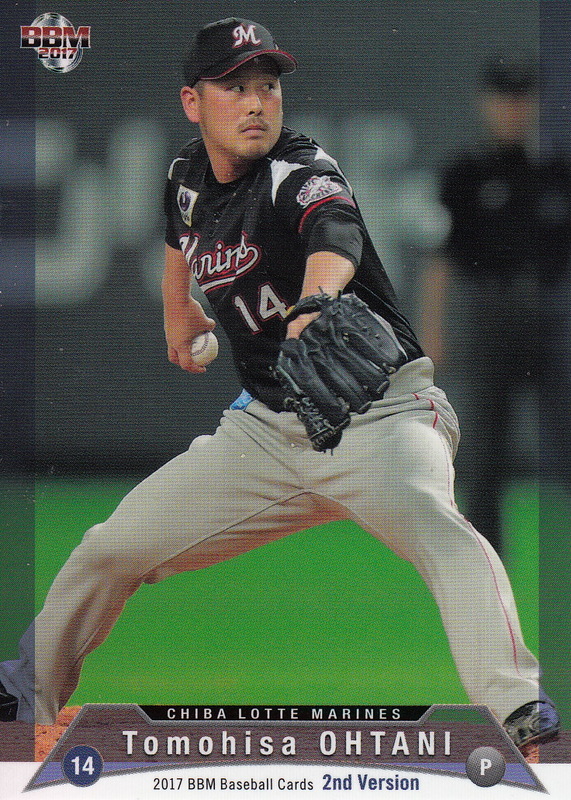 Dan Skrezyna of Korean Cardboard is doing something about this - he's putting out a self-published set featuring all the foreign players from the 2016 KBO season. 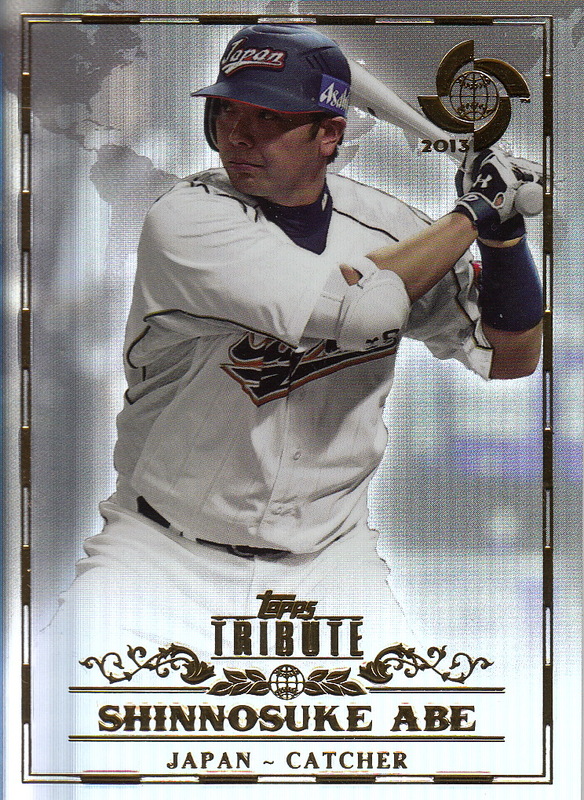 The set is called "Foreign Attack" and contains 46 cards - 41 cards for all the foreign KBO players from last season, four cards for the four foreign players who have been named MVP of the KBO in its history (Tyrone Woods in 1998, Danny Rios in 2007, Eric Thames in 2015 and Dustin Nippert in 2016) and a checklist card. The sets are only $23 shipped in the US ($30 shipped overseas although that price is not final) but Dan is only getting 20 of them printed up and at least eight are already spoken for. If you want a set, contact Dan as soon as you can. He's also planning on doing a 2017 set. Dan is hoping to have these sets out by the end of this month. - After several months of putting out reasonably priced sets of baseball cards, Epoch has jumped back into the premium sets. 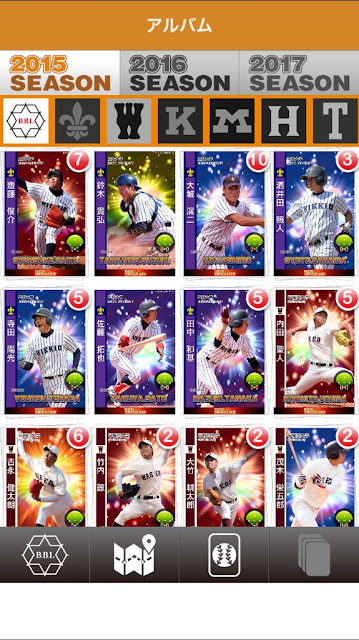 First up is a set called "Hankyu Braves Greats" which features..uh...great players from the Hankyu Braves. The MSRP on each box is 14,040 yen (~$128) although Discount Niki is selling them for 12,960 yen (~$118). I'm not completely sure but I think each box has just six cards in it - three base set cards, one parallel or foil sign card and two autographed cards. 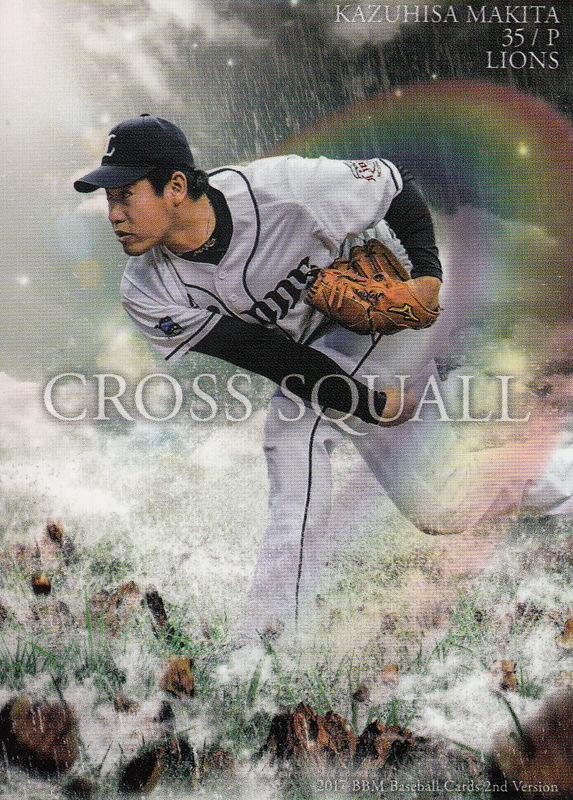 The base set has 30 cards that include Yutaka Fukumoto, Hisashi Yamada, Boomer Wells, Chico Barbon and Toshiharu Ueda. The set will be out on September 16th. - Epoch is also releasing a set called "Dragons Stars & Legends" that features both active and OB players from the Dragons. Each box has an MSRP of 12,960 yen but again Discount Niki has a discounted price of 12,000 yen (~$110). I believe that each box contains just six cards but I'm not sure of the breakdown - I'm pretty sure that each box contains at least one autographed card. The base set has 47 cards and there is some sort of parallel version of it as well as the autographed cards. Some of the OB players include Eiji Bando, Kazuyoshi Tatsunami, Norihiro Nakamura, Masaru Uno, Kenshin Kawakami and Kazuhiro Wada. The set will be in stores on September 23rd. - Hits issued a couple of team based "trading mini-colored paper" sets back in the spring. 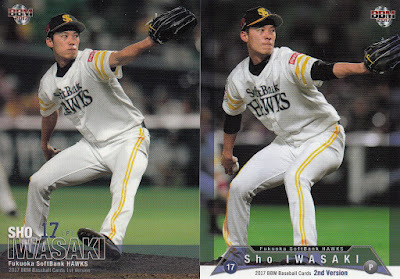 Each of these sets featured "cards" of eight different players for the Hawks, Baystars, Carp and Swallows. 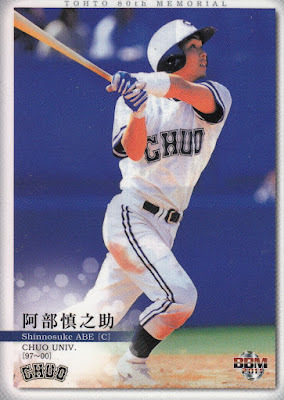 Hits is putting out a new version of the Baystars set called "Baystars ver 1.4" where they've now added cards for four new players to the original set. I'm not completely sure of what's going on with this but I think that each box contains 10 "cards" - four cards of the new players and six of the eight of the original players. The set comes out on September 9th. 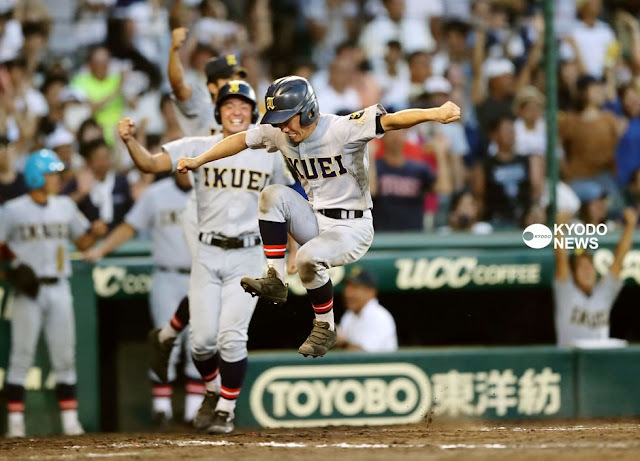 The 99th Japanese High School Baseball Championship (aka the Summer Koshien Tournament) kicked off this past week at Koshien Stadium in Nishinomiya. Koshien Stadium is the oldest professional baseball stadium in Japan - it opened in 1924, 10 years before there was professional baseball in Japan and twelve years before the team that calls it home - the Hanshin Tigers - were born. I don't know why I hadn't realized this before this past week, but the stadium was actually built to host the tournament. In the first two years (1915-16) the tournament was played in Toyonaka Park in Osaka (near the site of Osaka International Airport) and then from 1917-23 it was played at Naruo Stadium in Nishinomiya. (If you're wondering why this year is the 99th tournament when it started in 1915, it's because the tournament was canceled in 1918 due to the "Rice Crisis" and from 1941 to 1945 due to the war.) 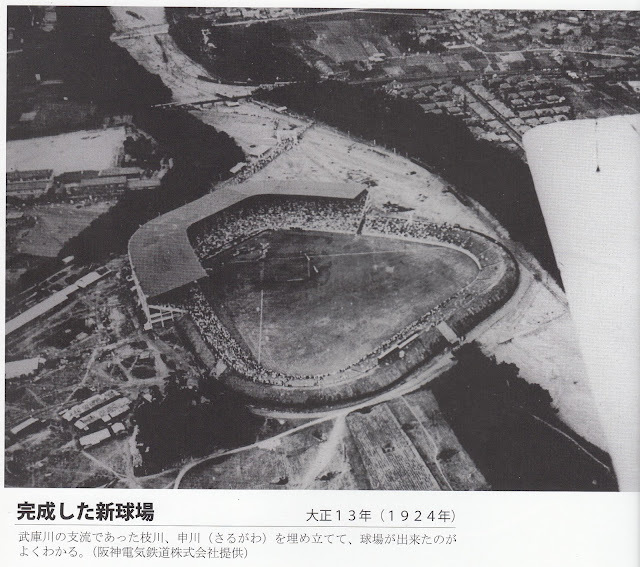 Koshien stadium was built to handle the crowds that the tournament attracted - when built it seated 55,000. It's current capacity is around 47,500. 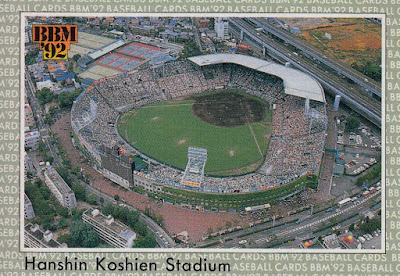 Here's a card of the stadium from the 1992 BBM set (#103). 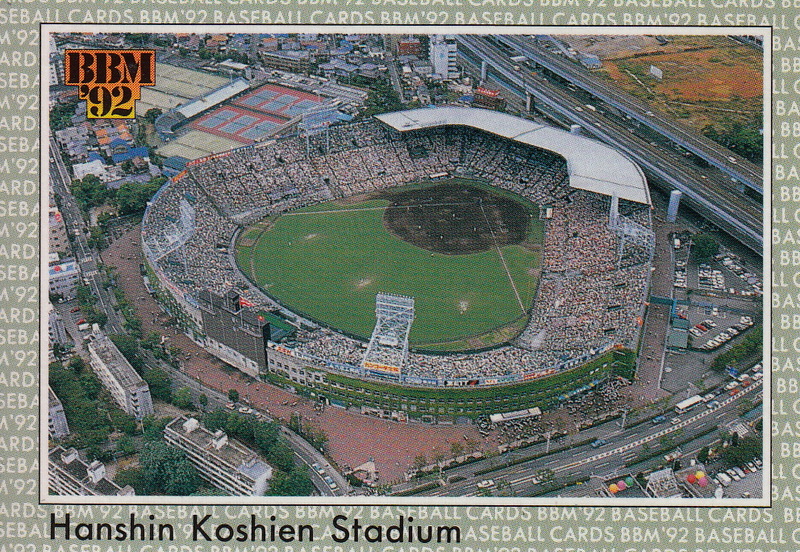 BBM did a subset that year showing all the ballparks currently in use (there were 11 since the Fighters were still sharing the Tokyo Dome with the Giants then). For comparison's sake, here's a photo of the ballpark from 1924. Hard to believe the surrounding area was ever that open. I swiped this photo from the book "Nostalgic Stadiums Of Kansai". I've said this before but I'd really like to see BBM do another subset showing all the ballparks. Of the 11 ballparks featured in 1992, only six are still in use (Chiba Marine, Koshien, Jingu, Tokyo Dome, Yokohama and Seibu) and one of those (Seibu) has gone through major reconfiguration - it has a roof on it now. I'd also like to see a set commemorating the tournament - maybe along the lines of the OB college sets BBM did a few years back. Something showing current NPB players in their high school uniforms and highlighting what they did at the tournament. Perhaps this could be a tie-in with the 100th tournament next year. 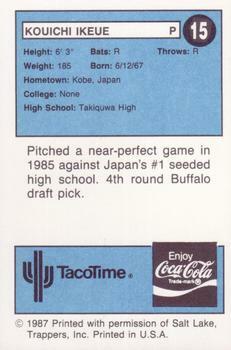 The 1980's were the Golden Age of NPB teams sending players to the US to play in the minor leagues. It started with the Seibu Lions sending players to San Jose in the California League in 1983 and by the end of the decade eight of the other NPB teams had sent players overseas to North America. Only Lotte, Nippon Ham and Hankyu/Orix did not. I don't know why this happened for sure but I can speculate. 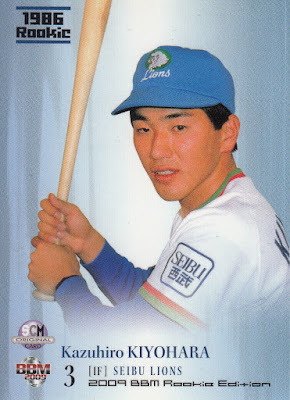 First of all Seibu was by far the most successful team in Japan in the 1980's, winning six Pacific League pennants and five Nippon Series during the decade so it would make sense for other teams to emulate them. Secondly the 1980's were when Japan was really flexing its muscles as a global economic superpower and I suspect that somehow sending players to learn in America tied into that although I don't think I know enough to understand quite how. 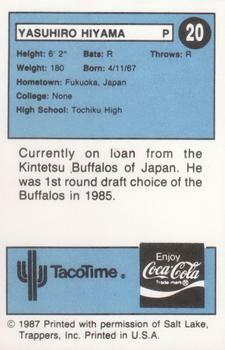 The first team to follow the Lions lead in sending players to America was the Kintetsu Buffaloes in 1986. 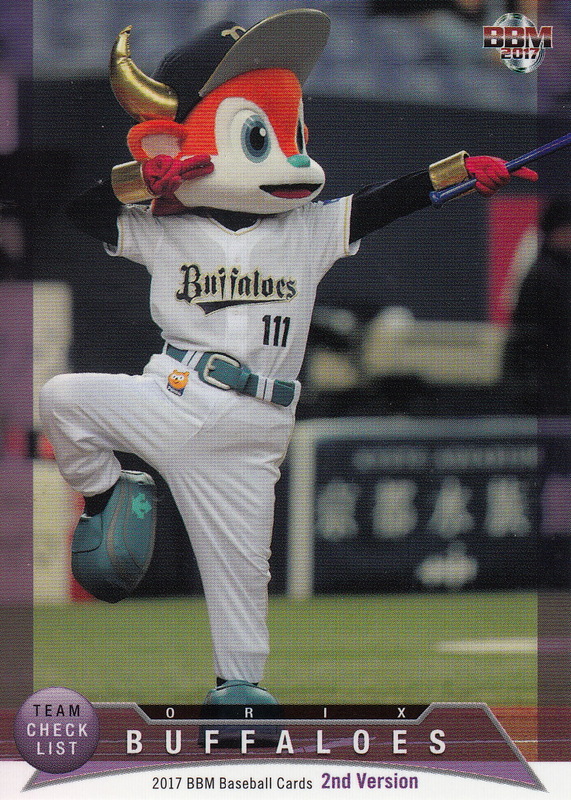 Like Seibu the Buffaloes made an agreement with an independent team in the affiliated minors - the Salt Lake City Trappers of the Pioneer League (Rookie Classification). Unlike San Jose however the Trappers were very successful on the field - they had won the league championship in 1985. 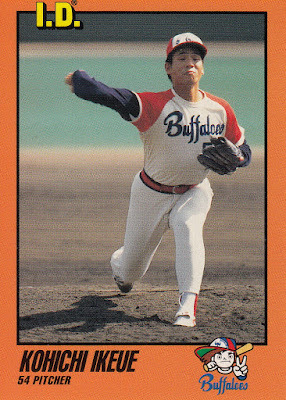 The Buffaloes sent two pitchers to Utah in 1986 - Tsuneto Fukuchi and Shintaro Yamasaki. 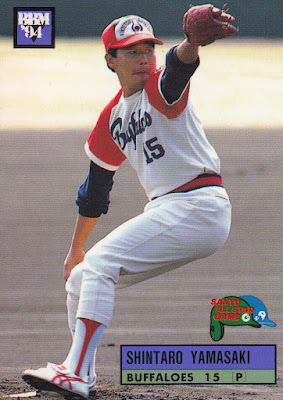 While neither player put up fantastic numbers (Fukuchi went 2-4 with a 5.43 ERA, Yamasaki went 3-5 with a 5.20 ERA) but both were mainstays of the rotation - Yamasaki had the most starts of any Trapper pitcher that year (14) and Fukuchi was tied for third most starts (with 12). The Trappers ended up winning another Pioneer League Championship that season. 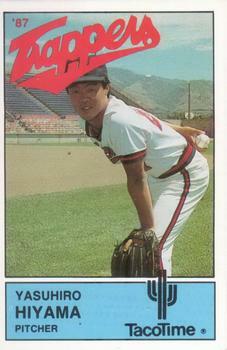 Kintetsu send two more pitchers in 1987 - Yasuhiro Hiyama and Koichi Ikeue. Ikeue started the second most games of any Trapper pitcher (12) and went 6-3 with a 4.70 ERA while Hiyama started seven games and went 3-1 with a 5.57 ERA. The Trappers had a record setting 29 game winning streak that season on their way to their third straight Pioneer League title. 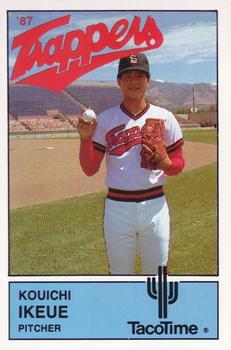 The Buffaloes did not send any players to Salt Lake City in 1988 and the Trappers failed to win the league championship for the first time that season. 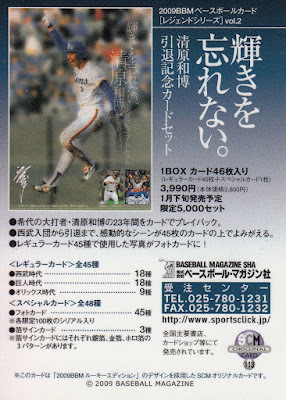 The two events are probably not related but just to make sure the Trappers got three players from Kintetsu for the 1989 season. 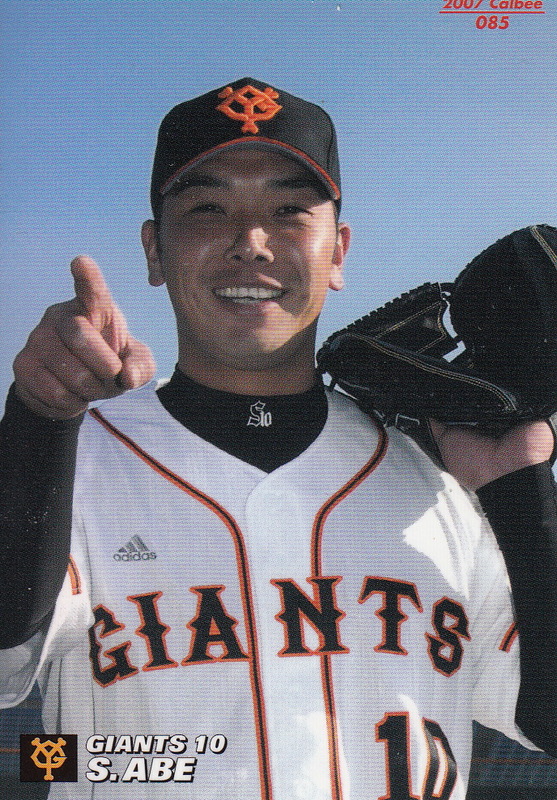 In addition to the now standard two pitchers (Akihiro Fukushima and Shigeki Taguchi) the Trappers also got a position player - Shingo Matsukubo. Fukushima went 3-5 with a 5.10 ERA in 16 games that were split between the starting rotation and the bullpen. Taguchi pitched almost exclusively out of the bullpen - he only made one start in the 14 games he appeared in, going 0-1 with a 8.57 ERA. Matsukubo barely appeared for the team - he got one single in six pinch hitting appearances. It's not clear to me that he ever actually played in the field. The Trappers finished in second place but suffered their only sub-500 finish in the eight years they played in the Pioneer League. 1989 was the final season the Buffaloes sent players to Salt Lake City. I don't know if either the Trappers poor finish or the Buffaloes winning the Pacific League that year had any effect on the decision to end the agreement - in fact I don't know who decided to end it. The Trappers had their third straight second place finish in 1990 but made the playoffs which they ultimately lost to Great Falls. They won the league championship again in 1991 and finished first one last time in 1992 before losing in the playoffs to Billings. To some degree it was an embarrassment for MLB to have an independent team dominate a league of affiliated teams and the Trappers were ultimately eliminated by the AAA Portland Beavers moving to Salt Lake City in 1993, forcing the Trappers to move to Pocatello Idaho and become a Co-op team called the Posse. The team moved to Ogden, Utah in 1994 and became the Raptors. They picked up a Player Development Contract with the Brewers in 1996 and have been affiliated with the Dodgers since 2003. It's probably not an unreasonable assumption that the success of the unaffiliated Trappers helped inspire the independent minor leagues like the Northern and Frontier Leagues which started in 1993. In fact actor Bill Murray was involved in the ownership group of the Trappers and would be involved in the ownership group of the most prominent Northern League team - the St Paul Saints. Yamasaki by far had the most successful career of the seven players. He spent 16 of his 18 year career at the ichi-gun level and went 87-92. His best seasons were probably 1988 when he went 13-7 with a 3.10 ERA and 1994 when he went 12-10 with a 3.41 ERA and made the All Star team. 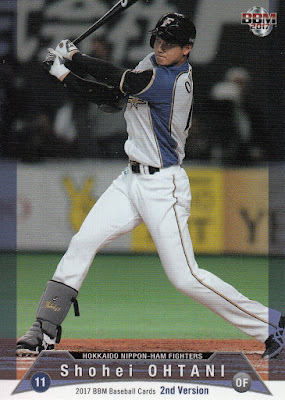 Yamasaki also has appeared on the most Japanese baseball cards of the former Trappers - including cards from Takara, Calbee, Lotte, Q-Cards, Konami, Epoch and of course BBM. Ikeue made his ichi-gun debut in April of 1987, several months before going to America. He's the only one of the seven players to play for the top team before playing for the Trappers. He ended up spending most of his career working out of the bullpen - only starting 16 of the 167 NPB games he got in. 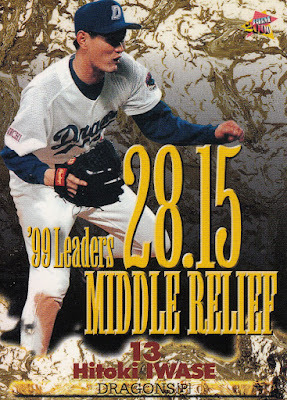 His best season was probably 1994 when he went 4-1 with a 2.65 ERA in a middle relief role. He had around 10 Japanese baseball cards, mostly from Takara and BBM. Matsukubo only had 149 plate appearances in 79 games over six seasons with the ichi-gun Buffaloes but still managed to have five Japanese baseball cards - all from BBM except for one Takara card. 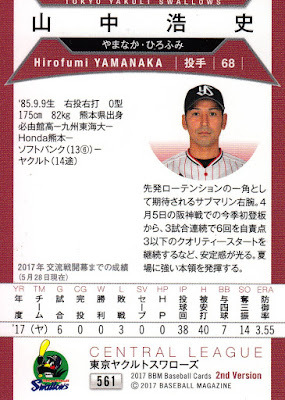 Hiyama did this one better - despite never making an appearance at the ichi-gun level, he had two Japanese baseball cards - Takara issues from 1986 and 1987 (neither of which I have). I would guess this would be a function of him being the Buffaloes's 1st round draft pick in 1985. 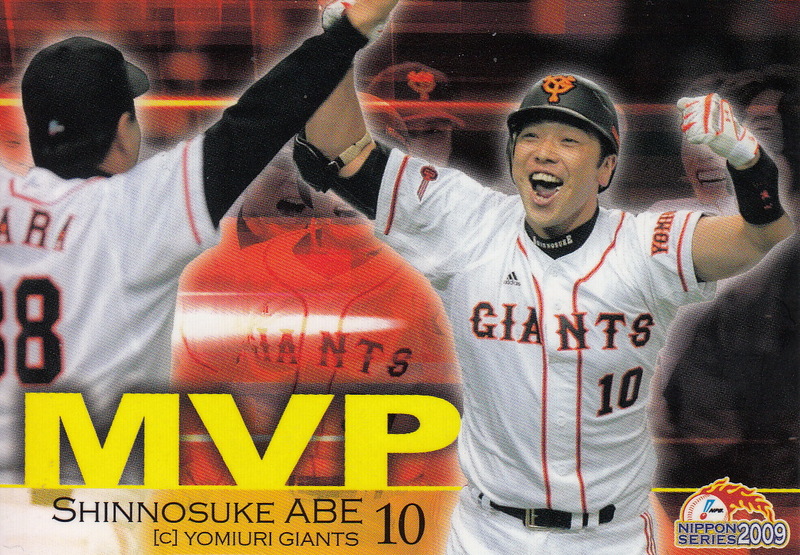 None of the other three players had any Japanese baseball cards. Fukuchi is the only one of the three to play at the ichi-gun level - he made one appearance in 1987. 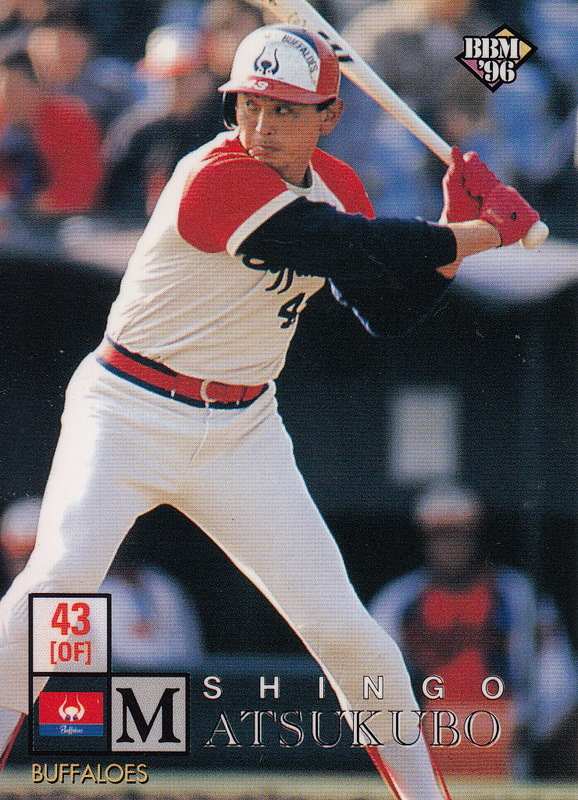 According to Baseball-Reference, Salt Lake City was not the only minor league team that Shigeki Taguchi played for in 1989 - he also made 63 appearances for Salinas that season. 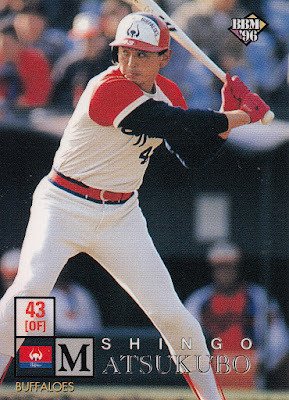 This seems a bit odd to me that Taguchi would get in that many games with Salinas and still appear in 14 games with Salt Lake City. There's also the fact that Salinas' agreement was with the Hawks and Swallows. 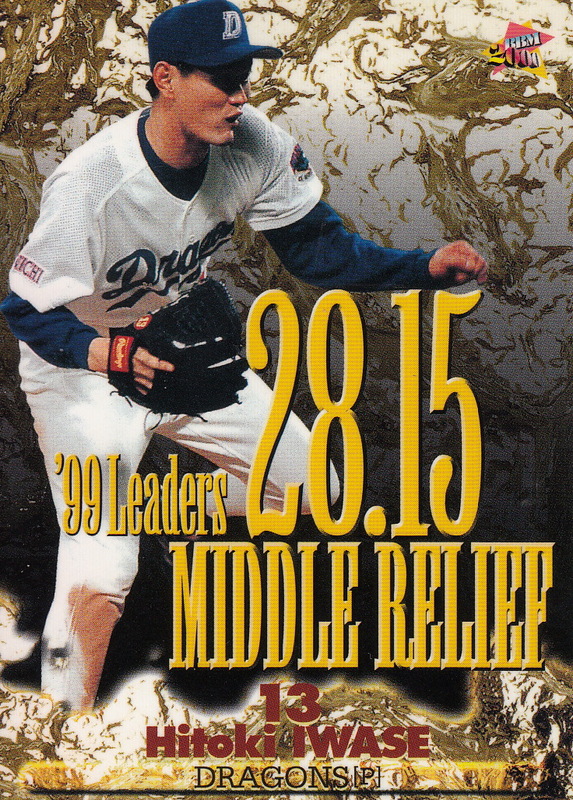 Baseball America's 1990 Almanac lists the pitcher with Salinas as "Dragon Taguchi" which doesn't really help much. 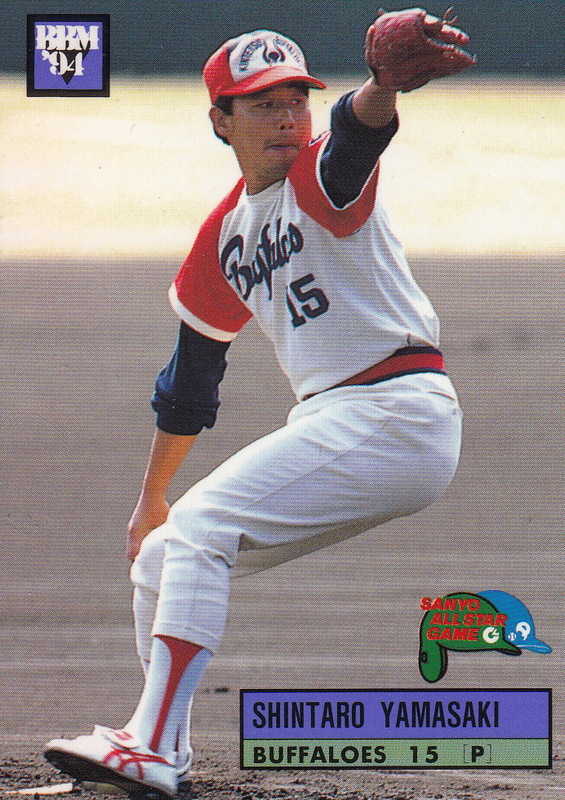 I wonder if it's possible that the Salinas pitcher is actually Ryuji Taguchi, who was a left handed pitcher (like Shigeki Taguchi) and was the Hawks #1 pick in the 1984 draft. I don't actually own these cards - I swiped them from Trading Card DB where Jason had uploaded them. There was also a team issued Salt Lake City set in 1989. 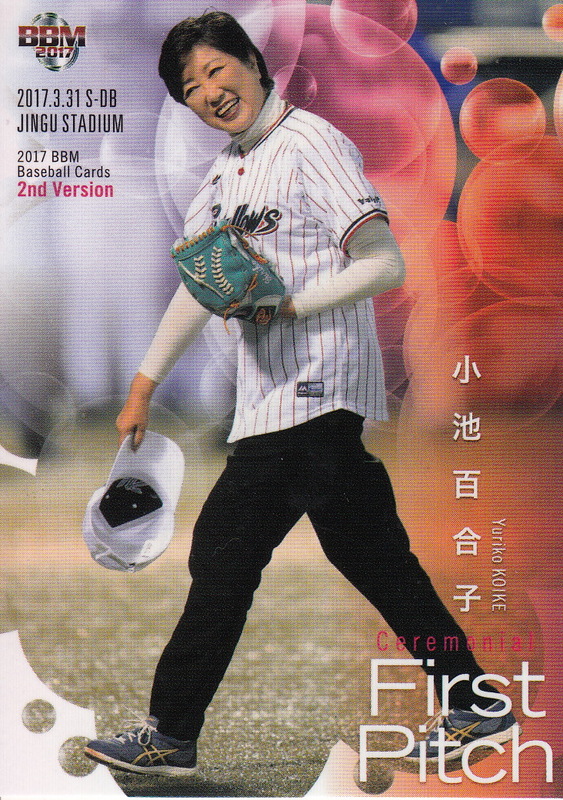 Fukushima, Matsukubo and Taguchi share card #12 in the set. Unfortunately I have not been able to find an image of this card online anywhere. If you recall, a month ago I reported that Calbee's Series Two this year had been delayed by the fact that the potato crop in Hokkaido had failed this spring due to typhoons that hit the island last summer and that Calbee had had to halt production of much of its snack lines because they didn't have enough potatoes to make chips from. I'm happy to report that Calbee's website is now reporting that the Series Two set will be released on or about September 4th. The base set has 72 player cards (six per team), 12 "Draft Pick" cards featuring the 1st round draft pick for each team and four checklist cards for a total of 88 cards. There's also the ubiquitous 24 card (2 per team) "Star" insert set. The "Lucky Card" redemption set is a 12 card "Opening Pitcher" set that features the Opening Day starter for each of the 12 teams. As always, Calbee has the checklist for the set available on-line. With Series Two being delayed by roughly 2 1/2 months you may be asking yourself what this means for Series Three which typically is released in mid-September. The answer is...I don't know. I've sent a message off to Calbee this morning asking about Series Three but I've not gotten an answer yet. 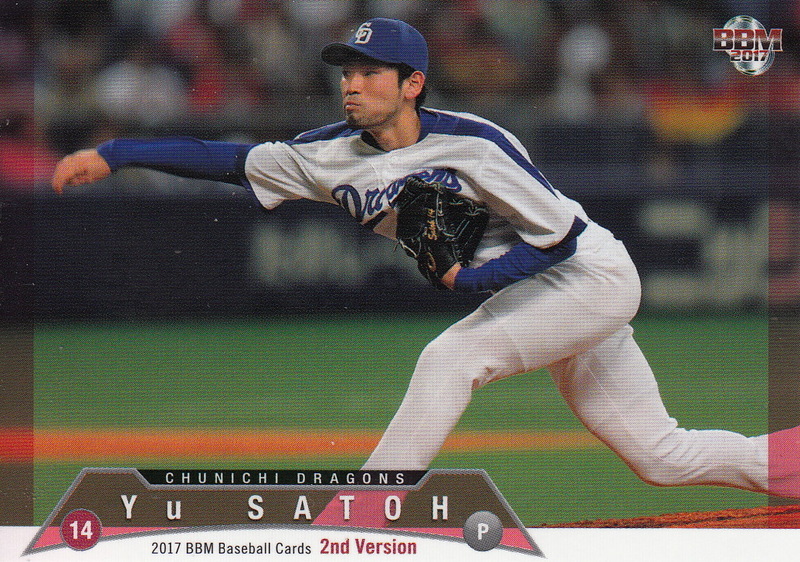 It would be somewhat disappointing if there were no Series Three this season since that would also mean that there were no "regular" player cards for Shohei Ohtani, Tetsuto Yamada and Yuki Yanagita among others. 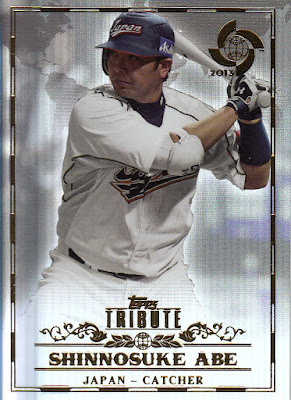 BBM has also recently announced a couple new team specific boxed sets - "Young Carp" and "Young Tigers". Both of these box sets are from BBM's "Authentic Edition" series and contain 26 cards - 25 cards for the base set and one "special insert" card that's either a memorabilia card or an autograph. The 25 players in the base set are all "young" players on the team - born after April 1990 in the case of the Carp and after April 1991 in case of the Tigers. There are nine possible memorabilia cards for each set - I think they're all jersey cards in the case of the Tigers but there's a Seiya Suzuki bat card available with the Carp set. The autograph cards include players who aren't in the base set (so they aren't necessarily young). The sets will be out in late August and the MSRP on them is 6000 yen. The sets are limited to 2000 apiece. 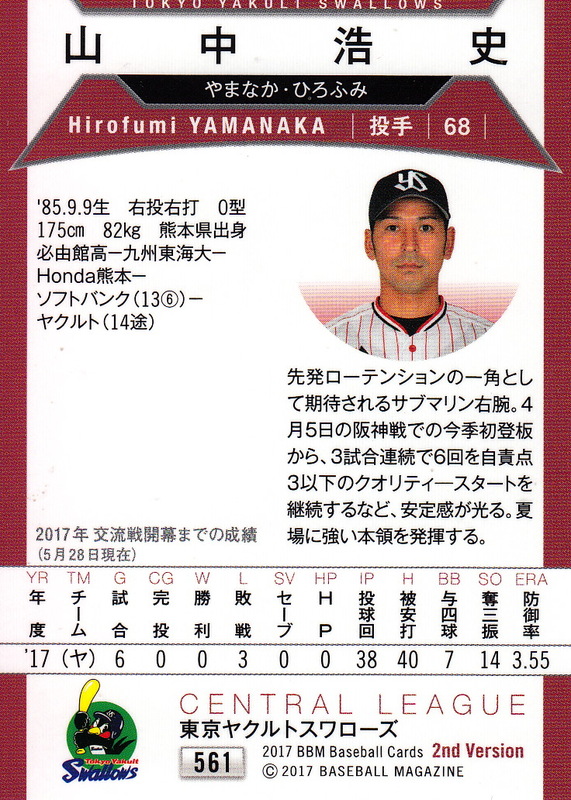 Hitoki Iwase of the Dragons got into his 950th game today which now gives him the record for most pitching appearances in NPB history, passing Hall Of Famer Tetsuya Yoneda. He got the save in the game against the Giants which extends his record for most career saves in NPB to 404. 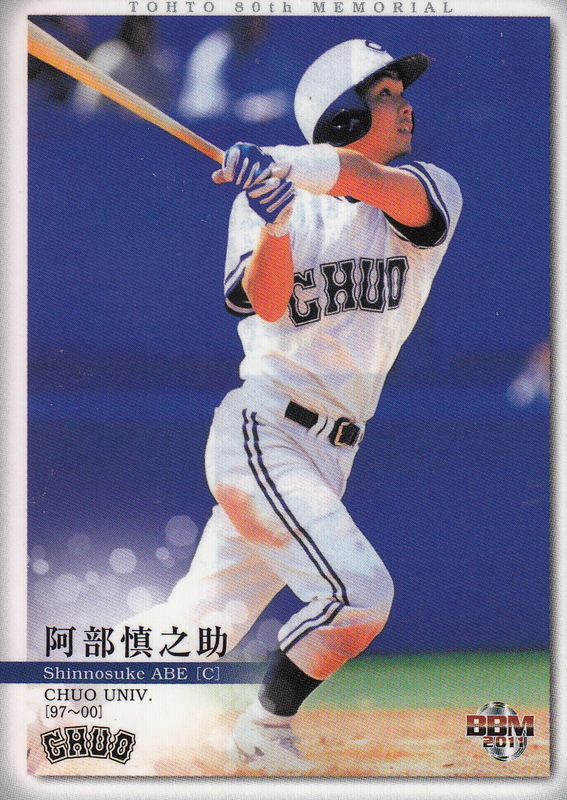 Iwase was Chunichi's' second round pick in the fall 1998 draft (Kosuke Fukudome was the 1st round pick). He had an outstanding rookie season in 1999 working middle relief for the CL pennant winning Dragons, going 10-2 with an ERA 1.57 in 65 games. In another season that might have won him the Rookie Of The Year award however 1999 was also Koji Uehara of the Giants' rookie season and he went 20-4 and led the CL in strikeouts with 179. Uehara won the award and I suspect Iwase finished a distant second although I haven't found the vote tally anywhere on-line. 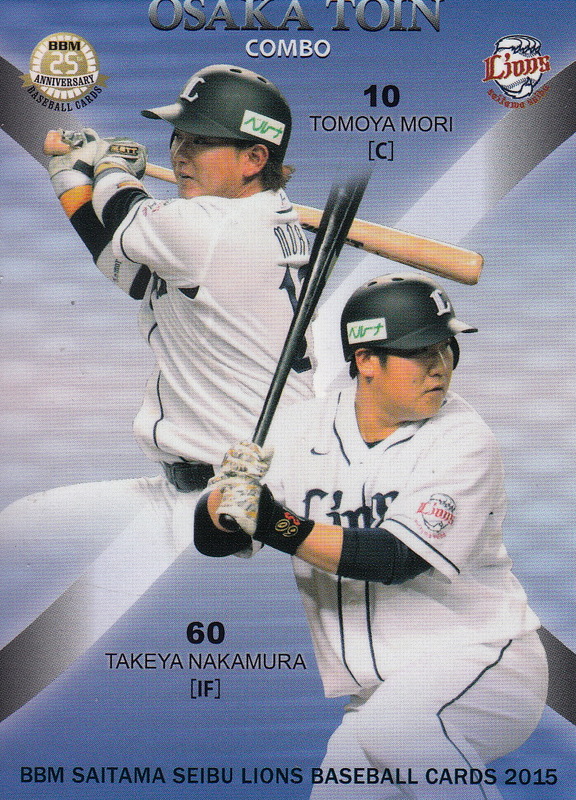 BBM stopped doing card sets for the Tokyo Big Six collegiate league after 2013 but it turns out that there is kinda-sorta another outfit doing cards for the league. The catch is that they are virtual cards that only exist on the league's official mobile phone app. The app is called "Tokyo Rocks" and is available for both Apple and Android platforms. Here's how it works. You get 10 points every day by opening the app and basically checking in (I think you get 100 points if you check in at Jingu Stadium). The cards cost 10 points each. You cash in your points and you randomly get a card. For the past two years there have been a total of 66 cards - 11 for each of the teams in the league. The 2016 cards were available until early April this year (or until you updated the app on your phone). Since then all you can get are the 2017 cards. (The switchover corresponds to the start of the Tokyo Big Six season this year). The cards do not have backs and there's no way to trade them with other people so they're just kind of a curiosity. I didn't get the entire 2016 set but I pooled resources with Dani (who I had learned about the cards from) to generate a nearly complete list of cards. 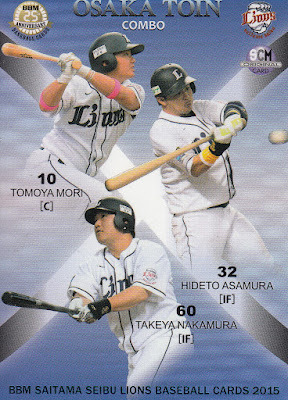 Some of the players in last year's set were drafted last October and are currently playing in NPB. 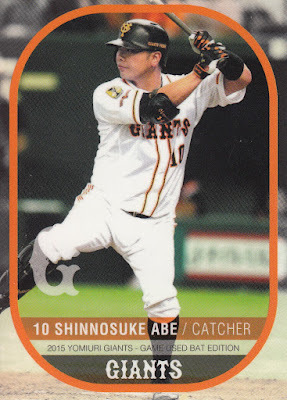 There's a little weirdness in this year's checklist - some of the players don't have uniform numbers and there's a "blank" card for one of the Meiji cards - apparently they recalled one of the cards. I want to thank Dani for all her help with teaching me how to get these cards and providing me with screen shots of all her cards so that I could create the checklists for the 2016-17 cards.